Fernando Llorente joined Swansea City from Sevilla for an undisclosed fee in August 2016. 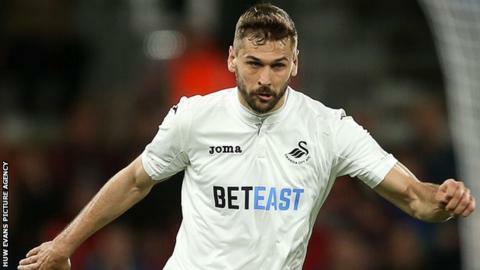 Swansea City head coach Paul Clement rued the absence of top scorer Fernando Llorente as his side were held to a "disappointing" 0-0 draw by Middlesbrough. Sunday's stalemate leaves Swansea one place and one point above the Premier League relegation zone. Llorente missed the game with an ankle injury which makes him a doubt for Wednesday's match against Tottenham. "You do miss him because he's a big focal point," said Clement. "That's not to say Jordan Ayew didn't play well - he gave us another dynamic Fernando doesn't have - but when you're crossing a lot of balls into the box, Llorente is a miss. "He has an ankle issue which I'm hoping won't keep him out for very long so Wednesday is achievable but he's still a doubt for the game." With five wins in their first eight games after Clement's appointment in January, Swansea had appeared to be steering their way to safety. But successive defeats at fellow strugglers Hull and Bournemouth - followed by Sunday's uninspiring draw with another relegation rival, Boro - mean the Swans are still deep in trouble. With title challengers Tottenham visiting the Liberty Stadium on Wednesday, the match against Middlesbrough was a chance for Swansea to extend the gap between themselves and the bottom three to four points. Their failure to do so was a missed opportunity, according to Clement. "Yeah, a little bit. We're disappointed because that was the objective, to win," he said. "I think there was some nervousness in the stadium, from both sets of players, from the supporters. That's normal - there's a lot at stake, there's a lot of pressure. We have to deal with that. "We've got eight games left, eight opportunities to pick up valuable points, and why not on Wednesday night?" Despite Swansea's inability to find a way through Middlesbrough's obdurate defence, Clement chose not to make any substitutions. Record signing Borja Baston, 20-year-old striker Oliver McBurnie and winger Jefferson Montero were among the unused players on the bench. "I thought a lot about changes, I always do," said Clement. "From half-time I was thinking about what we could do to change the game but, the more I watched it, the more I thought we were doing enough defensively and doing enough offensively as well. "I've got good players on the bench and I've got confidence in them and on another day I could have used all three of them. It just wasn't the feeling I was getting today."